Tahira Kashyap Teaches Us How To Be A Total Badass! Over the last few days, it has been impossible to read any kind of media without stumbling across a mention of Tahira Kashyap. And for good reason. This 35-year-old boss lady has pretty much been defining the epitome of battling the odds and coming out stronger for a while now. Hailing from Chandigarh, Kashyap has a Masters in Mass Communication. She’s a writer, professor and theatre director. She has dabbled in PR as well as events and even had her own company. She has been a professor teaching for several years in the Bachelors of Mass Media courses in Mumbai’s Mithibai College followed by R.D National College. If that doesn’t seem glorious enough, she is now about to make her directorial debut for a feature film! She is based out of Mumbai now and has two children and a co-written book with her husband and first love, actor Ayushmann Khurrana. Her relationship with Khurrana may be the stuff of fairytales and we like to swoon over them time and again. But today, this story isn’t about that. For the uninitiated, Tahira was diagnosed with Stage 0 Breast cancer last year. This kind of news is beyond enough to shake a person to their core. But instead of losing hope, Kashyap decided to battle the odds like the absolute braveheart she is. In a very open journey that she shared on her Instagram account, she began a long and tedious battle against cancer. From the very beginning, she had the attitude of endurance and pushing through. And of course, of coming out stronger. They say the universe has no choice but to relent to a stubborn heart. And it indeed must be true because she is now healed, healthy and hearty as ever. Her journey has been a huge source of inspiration and I’d like to share 5 big lessons I took away from following it. We can choose to be the victim of our own story or we can choose to be the hero. Tahira Kashyap taught me that I wanted to be a hero. Kashyap sets the tone of the new generation of women who are an army that fiercely loves, protects and watches out for her kind. In what may have been one of the most beautiful, empowering things the world has witnessed in a while, she posted a picture of herself completely bald with the caption, "Hello world! That’s a new me with the old self! Was getting tired of the extensions, so this is how it is and it’s so liberating in every sense of the word, so much so that I don’t have to duck the shower while bathing or while picking up the soap! I never thought I would go bald, was stretching my time with the good ol’ cap for too long. But this feels so good.” In a time when everyone is trying to be the best versions of themselves on social media, this was so refreshing and inspiring to see. Doting husband Ayushmann Khurrana couldn’t help but share her picture with the caption ‘Hottie’ and Deepika Padukone too followed suit. What’s more? 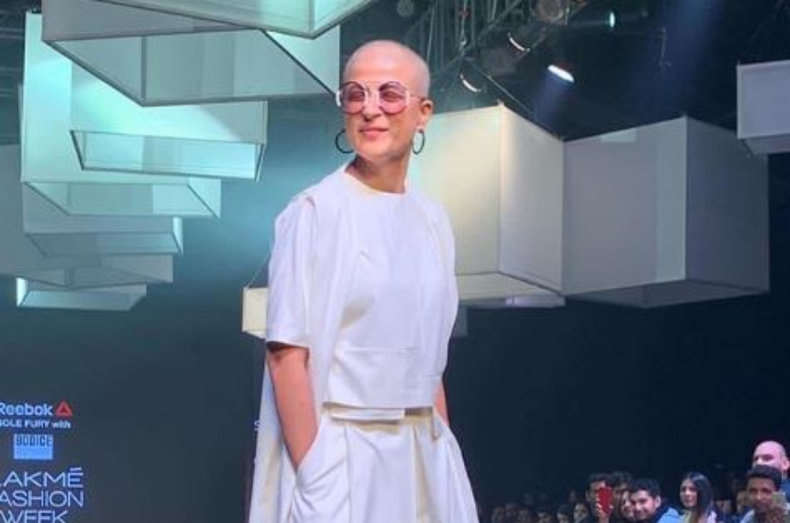 This unstoppable hero even walked the ramp for Bodice Studio at the Lakmé Fashion week. I cannot stop obsessing over the pictures!! What a queen! I honestly don’t even know what to say anymore. It takes unimaginable amounts of strength to be such a positive and celebratory person even when faced with such situations. I am so so inspired by this woman. Tahira Kashyap is the SHEROES we never even knew we needed! Just speechless, hats off to her will power and spirit, more power to woman, even she can upbeat destiny with her will power. 😘😘.